Zimbabwe has bought two Boeing 777 aircraft and an Embraer plane from Malaysia, finance Minister Patrick Chinamasa said on Wednesday. According to Patrick Chinamasa, the southern African nation had agreed with an unidentified Malaysian firm to buy four Boeing 777 planes for $70 million but had so far paid for two. Government has already paid $41 million out of the $70 million, Chinamasa said. 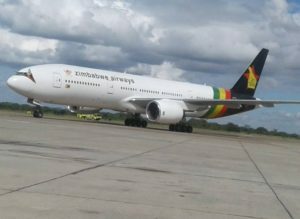 The planes will be used by Zimbabwe Airways, a new carrier whose ownership was not immediately disclosed. Local media reports that the new carrier belongs to President Robert Mugabe’s family, but Chinamasa said that was not true. The planes were acquired by Zimbabwe Aviation Leasing Company (ZALC). Their call sign, Z – RGM, and the airport are named after former President Robert Gabriel Mugabe. Aviation experts that have examined the Boeing 777 planes from Malaysia say they can operate efficiently for between 15 to 20 years. Note that the national carrier, Air Zimbabwe, is struggling to stay afloat, weighed by high operational costs and failure to attract passengers. The airline is saddled by a debt of over $300 million and is currently banned from flying to Europe because of safety concerns. Posted by Steven Addamah on April 13, 2018. Filed under Business. You can follow any responses to this entry through the RSS 2.0. Both comments and pings are currently closed.